On this Ladakh motorbiking odyssey, you'll have three days of riding powerful 350 CC motorbikes through the dramatic terrain of barren and brown mountains. At Leh, you'll need a day of rest and acclimatisation, before you set off into the valley. 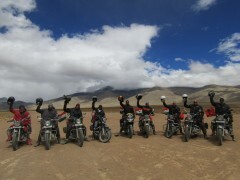 You'll ride through high altitude passes like the Chang-La and Khardung-La, and into the cold deserts of Nubra Valley where the double-humped camels wander. 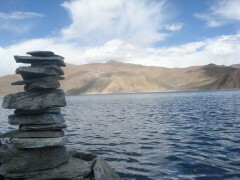 You'll also visit the Pangong Lake, where you'll see the colours of the water change as the sun goes down. 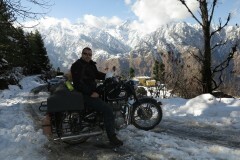 • Drive across the high altitude passes of Chang-La and Khardung-La. Today, you'll arrive in Leh and check-in to your hotel. The day is free for you to rest and acclimatize to the city's high altitude. Drink plenty of water and avoid any heavy exertion. You'll have a short orientation session in the evening with your fellow teammates and road captain. Overnight in a hotel at Leh. Spend the day at leisure. You can visit the local marketplace of Leh for any last minute shopping or explore the city on your own. A few local attractions around Leh include the Pathar Sahib Gurudwara and the confluence of Indus and Zanskar rivers. In the evening, you'll get to test your motorbikes over city's narrow roads and bylanes. Overnight in a hotel at Leh. Explore Leh today, and visit ancient monasteries and palaces. Enjoying the feeling of wide-open spaces all around. A moment of awe at Pangong Lake. Spectacular views all along the route. Check out by late morning and head to your next destination. Your trip ends here. Spend your night in Leh in twin or triple sharing hotel rooms or tents. Rooms have attached Western washroom, and are usually on twin-sharing basis, unless the total group size is in odd numbers, in which case accommodation may be on triple sharing basis. Welcome tea and dinner will be provided at the hotel. Overnight in tents in Nubra Valley. Spend the night in Nubra valley in twin or triple sharing tents. Todayâ€™s package includes meals of breakfast and dinner. Spend your night along the Pangong Tso lake at a campsite. You'll be staying in Swiss tents with attached washrooms, on twin or triple sharing basis. Todayâ€™s package includes meals of breakfast and dinner. You'll eat a hearty breakfast before checking out. You'll be transferred to the aiport. Trip ends here. There are flights to Leh Airport multiple times in a week. 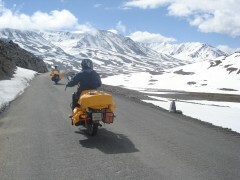 You can also get to Leh by road, if the roads are not blocked by snow. 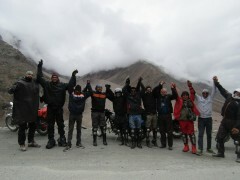 You will be starting your trip from Leh itself.